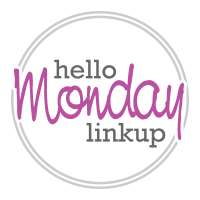 And today I'm officially co-hosting the Hello Monday Linkup with Caryl of More Pieces of Me! Yeah!! And thank you for continuous inspiration for that bib necklace! I feel your shopping pain. I did okay in June with my "no shop" but ended up shopping and went way over board in July. I think I am calling August a reigned in shopping month. You look super cute! Your hair always looks so great! I did a #noBuyJuly15 challenge, and it was pretty good! Although I did buy a $10 shirt on sale it could have been much worse! We were even in the paper and on the TV talking about it, it was pretty cool. Have to say that helped me stick to it, knowing I'd been on the record in the paper saying I wasn't going to spend! thank you so much for hosting the link up! It is so good to stop shopping some times...love your necklace! I mostly shop my closet and therefore have never had a problem with a self imposed no purchase. You know, I just purchased two items for August...and then realized I still have a large medical bill coming from breaking my foot earlier this summer. I think I'm due for a "no shop the rest of August" to make up for it! 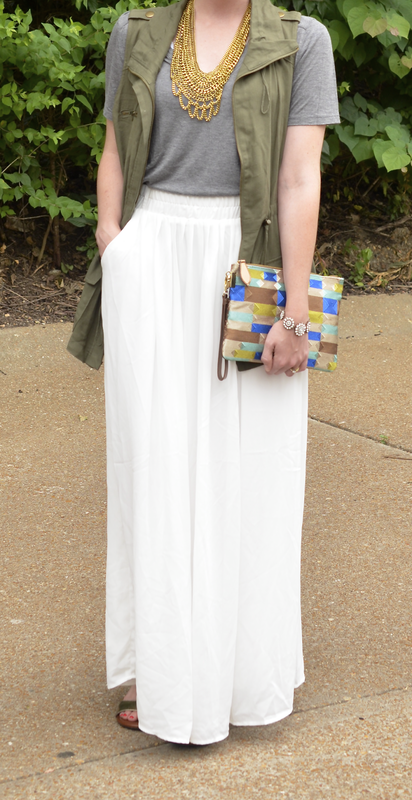 I love how your clutch brings the outfit together and your maxi is gorgeous! Oooh, love this combo. 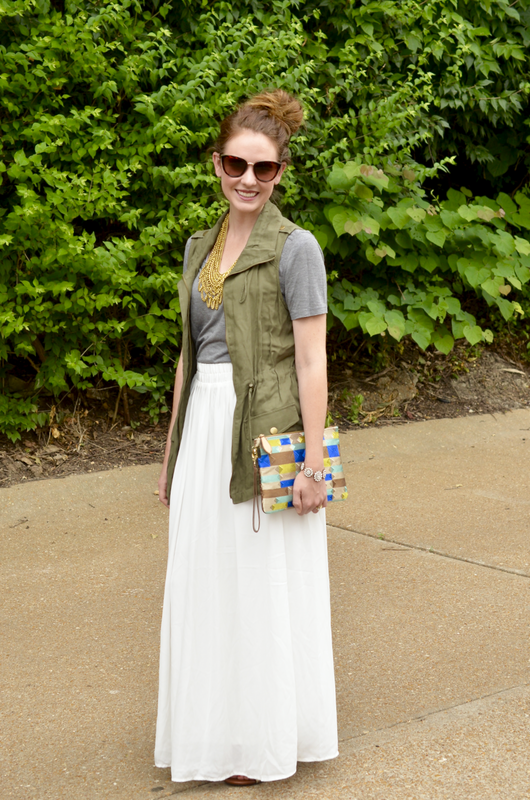 I'm always looking for new ideas and I love that you paired your utility vest with a maxi skirt. I'm also featuring a utility vest today, they're so versatile. This is such a cute look! I love that necklace! I am on a bit of a spending freeze too. I did really well in July but I'm really itching to go shopping soon. lol! Completely obsessed with this outfit! Would have never thought to pair the utility vest with the long skirt. It's gorgeous! Good luck on your no-spend August if you decide to do it!! LOVE this look--the mix of casual vest, pretty skirt, and chunky chain necklace is just perfection. It's making me want to get a maxi skirt like this so I can recreate it! You look so cute! I totally feel ya on the frustration of having to link to similar pieces! So pretty! 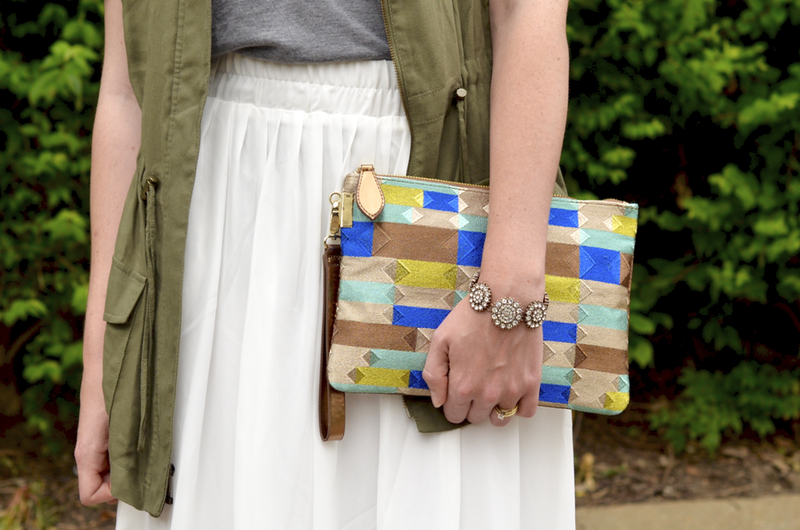 Love your vest and clutch! 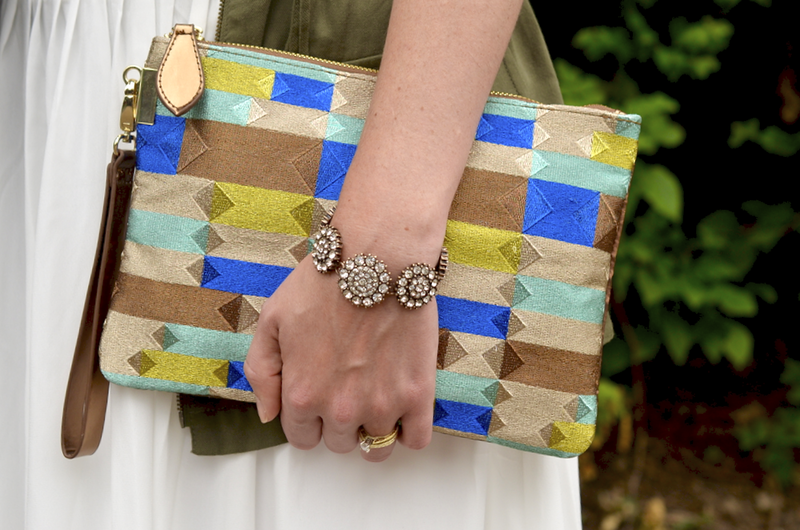 This is such a fun clutch! I've been thinking of doing a No Spend September, good luck if you decide to do it this month! Such a pretty look - I love the layering of the long skirt and the long vest. And good for you trying to do a no money spent august - Ugh i really need to do that as well after spending a ton at the Nordstrom anniversary sale! I am loving that clutch! Its such a bold statement! ooh I love that vest! need something like that! This crisp white skirt+the bright clutch is beautiful! I love that skirt! It's so boho and feminine, so pretty! After that #NSale, I need a no shop August, September and October! Haha...I'll commit to August if you do...;) Peer pressure, did it work? Loving that Maxi skirt too! Such a cute combo you got going on!! Love it! But I guess shopping in August is a must. We can’t say goodbye to Summers without adding some incredibly cool outfits to our Summer wardrobe. I love this look look so much! I loved how you styled this look and adding the vest is so a great touch! I think you could probably wear this look in the fall too. 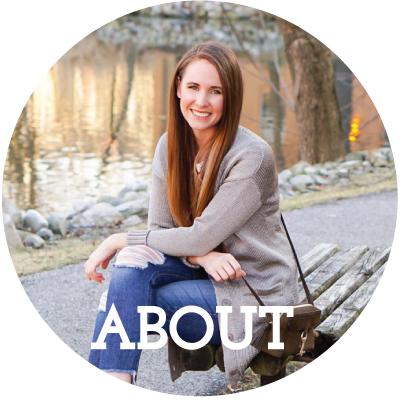 I had to laugh as I was reading about linking up to similar items -- I do that all the time and the search for those items is the most boring part of blogging! ;-) I have a vast wardrobe and still wear items from 10 years ago, so most of my items are "similar". And I don't have much money to shop these days, so reworking my existing wardrobe is the way to go. I wish I could add your gorgeous necklace to my closet, though! Just bought a military vest at Target and started pinning ideas for outfits when I came across this post from your blog. LOVE this outfit. That bag is so unique and the bib necklace makes a beautiful statement. Definitely pinning this.